The humble balance board has come on a long way since its inception, but what’s come on far more is how we use them and our understanding of why they are so good for us. The balance board probably first surfaced 100 years ago if not more… as a children’s toy and a tool for circus performers to do tricks on. The idea was, and still is, simple – make a surface to stand on that is inherently unstable, in so making ‘simply’ standing a challenge, and to some – fun! I’ve made one at a music festival simply by putting a plank on a log and people loved it. Surfers and toy manufacturers made the balance board popular in the USA in the 1950s. Bongo Board was the brand, and is now, like Hover, the byword for a basic roller balance board. Surfers liked them to practice their skills when the waves were flat or they were away from the water… and children liked them for the simple pleasure of the challenge of balancing on a moving board without falling off. And it’s worth listening to surfers and children. History tells us that they often have an ability to see more clearly than their constrained adult counterparts! Think how important play has been found to be in the cognitive development of our children, and how looking after our oceans has suddenly become a mainstream concern after surfers have been banging on about it for decades. Listen to the surfers and children people! Fantastic training for all board sports and skiing. While balance boards have never gone away, it is only recently that their use has really started to flourish, and this is due to our increased knowledge about how our bodies and minds, and our desire to be more active for more of our lives, whether to be a great sports person, or to simply get to the shops without aches, pains and a possible mishap with a dodgy pavement. Late last century physiotherapists started using the most basic of balance boards – the wobble board and rocker board – to help rehabilitate clients post injury. They recognised that the movement the boards provided enabled people to gain better movement and strength in a recovering joint. They have been used extensively for ankle, knee, hip and spine issues with good results and many scientific papers have been written on the subject. The rocker board allowed a patient to work the legs (or leg) in just one plane of movement, isolating it from the other planes. A rocker board is a plank of wood with a rocker attached to the underside, making a mini seesaw. This made the movement very safe, and allowed strength to be recovered gently, minimising the risk of re-injury. Physiotherapist’s still use rocker boards to this day for early rehabilitation of many lower limb injuries. Due to our further understanding of the human body and mind in our quest to achieve more and suffer less, we have found a host of other uses for the simple rocker board. Children diagnosed with learning difficulties, including dyslexia and ADHA, have shown dramatic improvements in behaviour, ability to concentrate, cognitive development and academic achievement by regularly following a program based on balance board use, and needing an easy start, the rocker board is the ideal type of balance board to start on. Equally the rocker board has proved useful for people often at the other end of the age scale, recovering stroke victims use balance boards to re-learn how to walk again, those suffering with multiple scoliosis has slowed their physical decline and sometimes even made improvements allowing them a better standard of living for longer. The wobble board is the next step up the balance board line, adding a bit more movement and so progression to the rocker board. Whereas the rocker board simply rocks side to side, the wobble board can rock, or tilt, in all directions – multiplane movement rather than single plane. 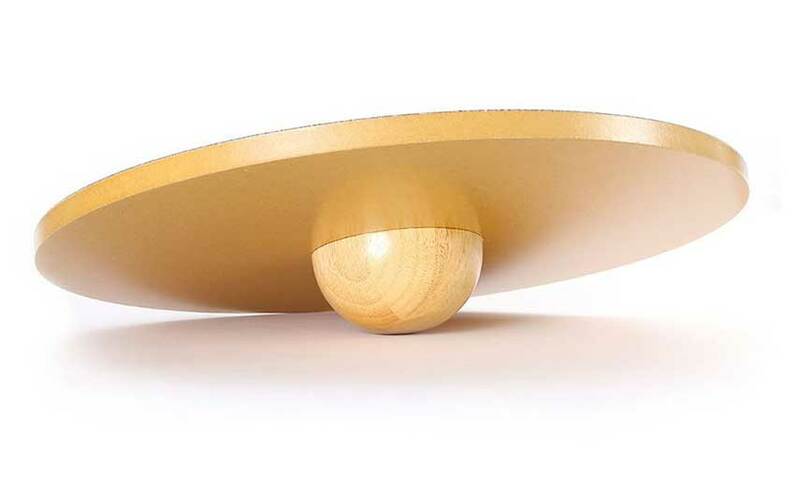 Wobble boards are still most commonly found in physiotherapists treatment rooms, often a circular bit of wood with a half sphere fixed to the underside. This tool allows the therapist to introduce multi plane movement to a recovering patient, adding extra difficulty to the challenge of remaining in control when stood on it. The extra challenge not only works the muscles and tendons more, as science has furthered our knowledge, we now understand that it also helps repair and enhance our balance and proprioception. I’m sure you’re aware of what balance does for you. If you are not, try standing on one leg. Now try closing your eyes. Notice the difference!! This is because we use our eyes and vison is a vital part of our feedback loop that keeps us balanced, i.e. stops us from falling over. Our proprioception is something scientists are still learning about, it is often referred to as our sixth sense, and some would argue, our most important sense. Remember the first time you tried to catch a ball, or drive a car. Probably not. But I’m sure you’re aware you did not find it as easy as you do now. Watch a baby learning to walk, and think how you walk without thinking. This is proprioception in action. It is believed to be the body’s ability to learn from previous experience, and sometimes to be able to react without needing the brain to tell it to do so. So now when you are driving and an animal jumps out into the road, do you think, brake, I must brake? Do you even think ‘which is the brake pedal’? Very unlikely. Your body just pushes the brake pedal. I even find I do it from the passenger seat! That’s your proprioceptive system calling on a learned response in an attempt to save a potentially dangerous situation. 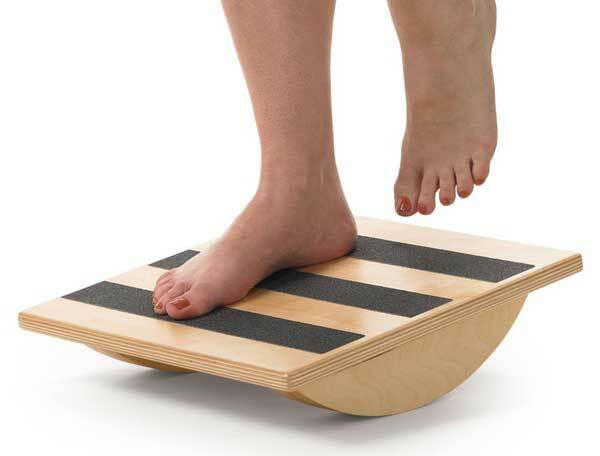 Scientists and physiotherapists believe that using balance boards is a great way of repairing and training our proprioceptive systems, and using a wobble board is often the first go to tool. All the while physiotherapists and scientists have been beavering away at using rocker and wobble boards, balance boards have also become more mainstream at the other end of the spectrum – sports people. Like I said, it all started with surfers. Surfers, especially beginners, don’t get much time balancing on their surf board, and balance boards gave them an easy and fun solution to keeping and increasing their balance skills when not on their surf board. What has become more understood is that these strengths and skills; joint strength, e.g. our ankles, as well as our balance and proprioception are important in whatever physical activity we are attempting. So now all good sports people use balance boards in their training. Not just for all the new and exciting board sports – snowboarding, kite boards, windsurfing, wakeboarding, stand up paddle boarding (SUP) and the like, balance board training is now also known to be beneficial for runners, footballers, tennis players, anyone who wants to use their body to perform better. All of these physical pursuits require an ability to react to a changing or unstable base of support. A footballer must be able to turn on a sixpence, inherently knowing where their body is and what it is trying to do to get to the ball or keep the ball under their control. This requires a great sense of balance and a keen proprioceptive ability, and using a balance board regularly is known to help this. This was often done using a roller balance board – basically a plank of wood balanced on a cylindrical roller. So now not only does the balance board tilt, it can also roll, or slide from side to side. Rather than a development of the wobble board, this is a development of the rocker board – the roller balance board works in one plane of movement while adding extra challenge with the extra sliding movement. 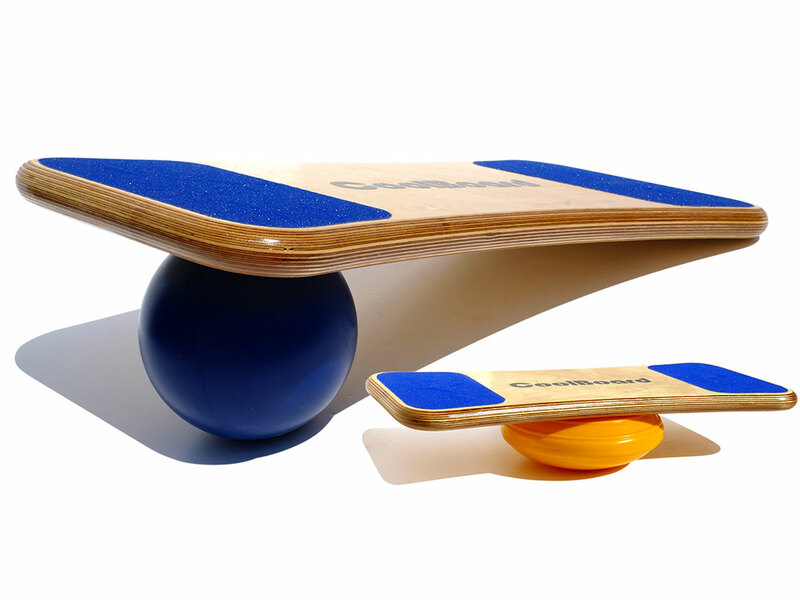 To further extend this physical training from single plane to multi plane, balance board designers have moved to sphere and ring balance boards. The one directional roller is replaced with a multidirectional ball, and the plank of wood has end stops replace with a ring to stop it rolling right off the ball. Now the balance board is freed of constraints, it can tilt and slide in all directions. This allows the body to be trained in all directions at once, mimicking real life movement, and so preparing us for that movement. And this fits into our relatively new understanding and want for functional training. And now for what I see as the magical advent of our understanding of why balance board use is so fantastic for all of us. As our knowledge of the body and how to improve it has increased, the divide between injury rehabilitation and physical training has narrowed to the point of disappearing. 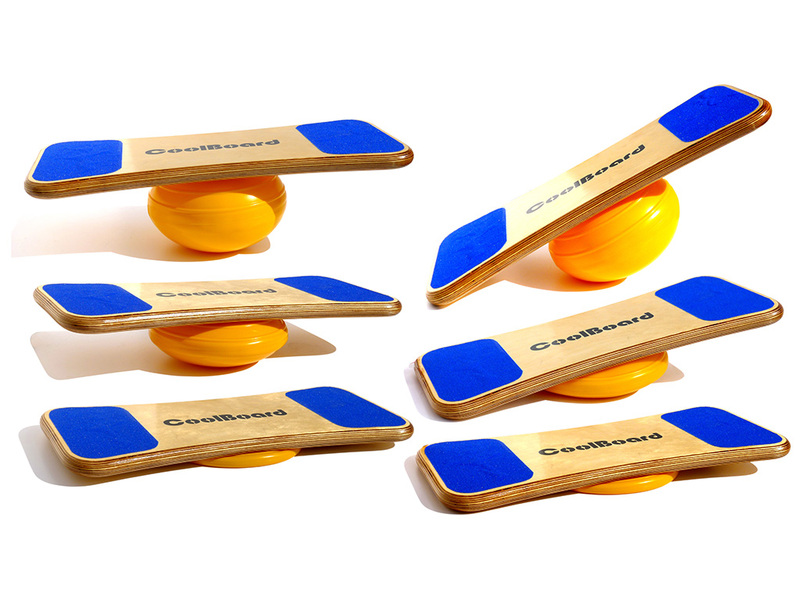 We know basic balance boards help our rehabilitation and basic physical development. 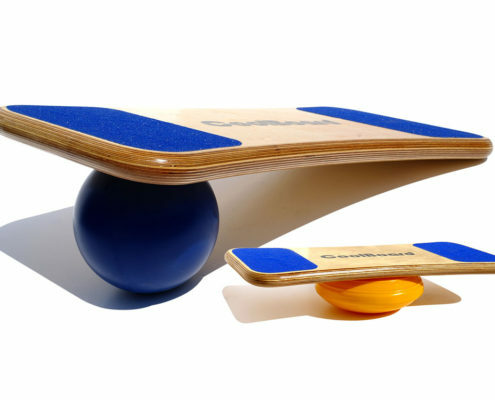 We also know a more challenging balance board will help an already well trained athlete. And now we understand that using a balance board can help all of us, whatever our ability. Whatever you do… from getting up in the morning, to dodging the bus on the way to work, to keeping active while standing at your standing desk, to jumping on your surf board or running around the pitch at the weekend, to extending you active ability as you age… joint strength, balance and proprioception are always required, and the better we train these attributes of our physical health, the better a life we can lead. There’s never a bad time for you to get a balance board, but I’d say the sooner the better… get on a balance board, get balancing, and enjoy your life more. 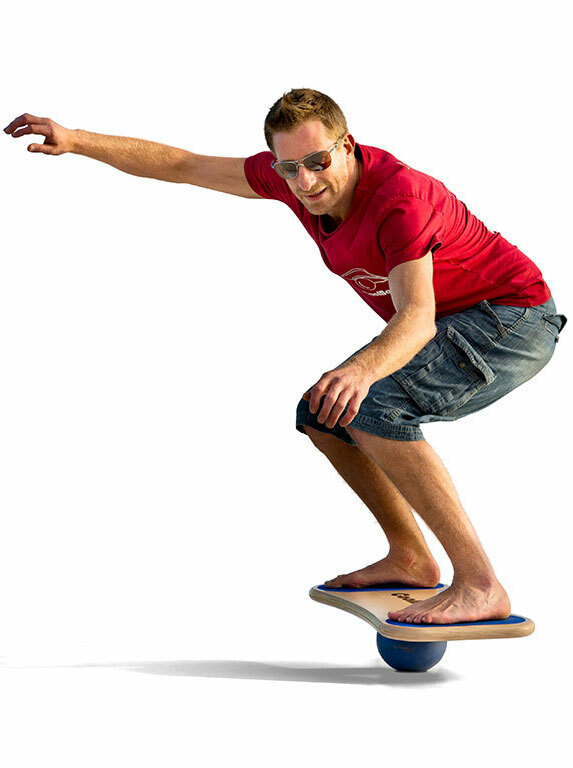 And the best bit… using a balance board is FUN… a whole lot of fun, and you can do it almost anywhere… at home while watch TV, in the office, in the gym, on the football pitch side-line or in the chalet before you jump on your skis…. This article was written by me, Nic Smith, CoolBoard creator – now balance board expert, while balancing on our new prototype CoolBoard. Thank you for reading, and as I always say – keep it steady! The world’s only true 360° balance board, and the best for all applications because the patented multi-directional movement of CoolBoard improves poise, joint strength and muscle strength.